:Is the book of Psalms still relevant for today's kids? Do children really need to hear those ancient songs and poems? Of course! God never changes, and his Word still changes us. Dandi Daley Mackall retells 25 Psalms using simple language and engaging rhymes to help children meet God in a new and profound way and grow a lifelong love of the Psalms. Beautiful, kid-friendly, four-color illustrations throughout the book help make Scripture personal and accessible for your child. 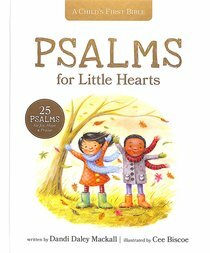 About "Psalms For Little Hearts, A: 25 Psalms For Joy, Hope and Praise (A Child's First Bible Series)"